A Military official defended the IDF against a video depicting soldiers fleeing from Palestinian rioters, said the video distorted reality. 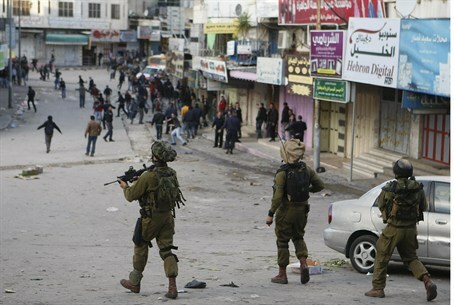 A Military official from IDF's Central Command is defending the IDF against recent public backlash over a video depicting soldiers in Kfar Kadum in Samaria seen retreating from Palestinian Arab rioters who were throwing stones. In the wake of the video, the Israeli public strongly criticized the army for showing apparent weakness and for ordering soldeirs againt using weapons to defend themselves, with many demanding that the IDF loosen its restrictions on rules regarding how and when soldiers can return fire against rioters who attack them with rocks and bricks. The military official admitted that the IDF erred in its specific handling of the situation but stressed that retreating is the correct way to act during such violent demonstrations. "The event which took place last Friday was an event which, if it had not ended in a way in which it seemed that IDF soldiers were fleeing from Palestinian rioters, the event would not have reached the media," the source said. The official said that the film, which circulated in the media last week and shows soldiers fleeing from rioters, was in fact distorted, and claims the soldiers were not fleeing but rather "chasing another group (of rioters) while other soldiers were guarding from behind. That's why the distorted reality occurred." Three soldiers were wounded in the incident - two by stones, one with a fractured hand and another with a headwound - and another burned his hand after a grenade exploded incorrectly. They were taken to Beilinson Hospital in Petah Tikva. The official said that in recent years the IDF has been forced to deal with more massive and longer lasting riots, some lasting hours on end, and has had to adjust the way its soldiers interact with rioters. IDF officials said they considered the incident “serious,” and that an investigation had been opened.